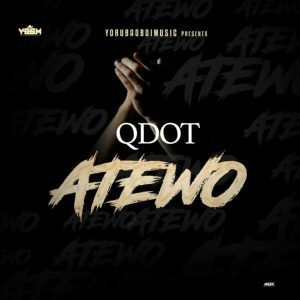 Singer, Qdot drops a brand new single titled “Atewo”. Yorubad Boi Music CEO, Qdot aka Alagbe is back with a new single titled “Atewo”. Atewo means clap in yoruba language. Qdot is one of the very few consistent street pop singers in the Nigerian music industry. The singer started his career back in 2012 when released his viral single “Alomo Meta” followed by his other hit single, Ibadan featuring YBNL bos Olamide and his much successful Wo cover. Qdot continues to dazzle as he drops this new on Atewo which he once again deliver his celestial vocals on a dance hall instrumental. Atewo will definitely disturb every corner of the streets in the coming months. You can download and share your thoughts below.